As the 12th International Tourism Exhibition opened in Tehran Tuesday, delegations from Iraq, Turkey, Oman and Afghanistan entered Iran. 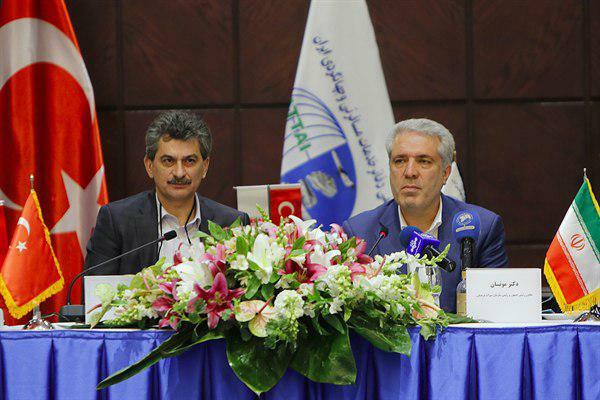 The first meeting was held between the Association of Turkish Travel Agencies (TURSAB) and the Iranian Union of Travel Agencies and Airlines, reported ISNA. The head of the Iranian Cultural Heritage, Handicrafts and Tourism Organization as well as the Turkish ambassador to Iran were also present at the meeting where the private sectors of both countries inked a memorandum of understanding on mutual cooperation. The head of TURSAB, one of Turkey’s most influential and significant tourism syndicates, said his delegation is comprised of TURSAB staff members as well as representatives from five coastal and historical provinces plus officials from the Turkish Culture and Tourism Ministry. He said his trip comes to enhance relations and settle problems facing the two countries. He touched upon the imbalanced tourism ties between Iran and Turkey, and noted his country seeks to strike a balance between the trips made to Iran and Turkey by the people of both countries. Derya Örs, a prominent Turkish Iranologist who was introduced as the Turkish ambassador to Iran five months ago, opened his speech with the famous verse “In the name of the Lord of both wisdom and mind, To nothing sublimer can thought be applied” by late renowned Iranian poet Ferdowsi. He also extended his congratulations on the 40th anniversary of the triumph of the 1979 Islamic Revolution of Iran. He said Turkey and Iran are not separable, are two heavyweights in the Middle East, and they will be the top regional powers if they join hands. He said it is right that Turkey hosts a large number of Iranian visitors, and fewer Turkish citizens visit Iran. However, he added, if infrastructural problems in Iran are solved, the number of Turkish tourists visiting Iran could rise. He said Iran should build more hotels in the cities of Isfahan, Shiraz and Tehran. The official underlined the current infrastructure is not efficient enough to handle 10,000 tourists visiting those cities at the same time. Ali-Asghar Mounesan, the Iranian vice president and head of Iran’s Cultural Heritage, Handicrafts and Tourism Organization (ICHTO), began his speech with some sense of humour. “I’m not as skillful as Mr ambassador to be able to translate what I’m saying at the same time, so I hope the interpreter will translate my words fully,” he noted. He also offered congratulations on the 40th anniversary of the victory of the Islamic Revolution. “I don’t know if you saw the rallies on the 22nd of Bahman,” said Mounesan, addressing those working in Turkey’s tourism sector. “Millions took to the streets in support of their country and establishment at a time when the Americans are once again exerting the harshest economic pressure on Iranians,” he said. “It has been 40 years that we have been under pressure for the sake of our independence-seeking revolution; still, our country has made much progress, and as Mr Ambassador mentioned, Iran along with Turkey is one of the biggest powers in the region, has a role in regional issues and is influential. These are the achievements of a period of time when we were under the toughest sanctions,” he said. Mounesan also touched upon the condition of Iran’s tourism infrastructure which the Turkish ambassador had criticized. “At the moment, there are more than 1,400 hotels and accommodations in the country. Around 2,000 projects with a price tag of over $12 billion are under construction. Of that number, 500 are hotels and accommodations. We are rapidly completing the infrastructure. Some 1,400 eco-tourism sites have been set up in villages, and their number will increase to 2,000. Some historical monuments have also been turned into hotels. So, there are no serious problems when it comes to infrastructure, though we have not reached the ideal point, either,” said Mounesan. He said the biggest problem is that Iran’s tourism sector has not been introduced and promoted, but sanctions cannot be imposed on the tourism sector. “40 years ago, we had 450 thousand tourists. The figure has risen to 6 million now, and we hope it will cross the 7 million mark by year’s end. We have reached this figure despite all the problems that the Americans caused by launching propaganda campaigns against Iran,” he said.